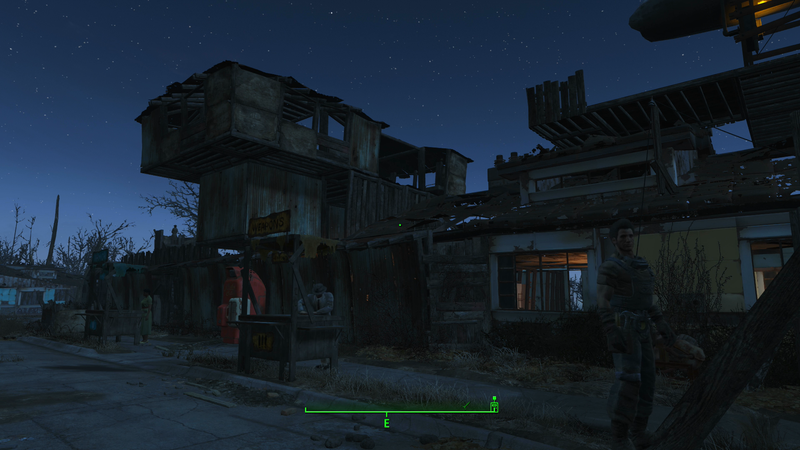 One of the features I was most excited for in Fallout 4 was the ability to construct my own home and settlements. Unfortunately when I started trying to construct my new home, I was unable to really build anything more than a glorified shack. There is basically no real tutorial in game to explain the finer parts of building your dream home, so let me be your angry foreman, and guide you through the basics of post-apocalyptic home construction. Find your ideal plot of land, for this guide I’m going to be using Starlight Drive-in. While in workshop mode scrap everything that is highlighted yellow. Anything highlighted green can also be scrapped if you wish, or you can choose to store it in your workshop to place in your settlement later. It saves resources to store decorative items instead of building them from scratch. If you make a mistake with item placement DO NOT scrap, store instead, it will save you resources. If you place a wall, then scrap it you will only get half your resources back. You want to have at least the same amount of food, water, and beds as you have settlers. Defense should be at least as high as your food, and water value combined. Alright now with that out of the way, let’s throw on our hard hats, and flannel shirts, and get to work! First thing you are going to want to do is lay out your floor. The easiest way to do this is by using the shack foundation. The shack foundation allows you to raise you floor to your desired height, making building on uneven surfaces easier. Lay out your desired foundation shape, if you want to make something large make sure you have lots of wood and steel. You will go through resources pretty quickly. If you are planning on making your building have a second level, now would be a good time to decide where you want your staircase to be. I’m going to use the shack stairwell that includes the large floor area. If you use the smaller one you can use small floor pieces to help keep your building square. You following along? Now with all that useful knowledge let’s finish off our main floor. Remember the snap together system is super finicky, you may need store some pieces and change the order you lay them out in. Wall ends don’t like to snap to a hole next to a wall, but straight walls will snap to a floor next to a wall end. Trial and error is your friend, every piece eventually snapped together while I was building this house. Looks pretty good if I do say so myself! Now onto the second floor, where we are gonna a nice open concept sleeping area, and a deck! For upper floor areas, you are going to want to use Shack Upper Floor, and start building from your staircase. If you used the smaller staircase you need to start by building small floors around your ladder then switch to the larger Shack Upper Floor. Everything will basically work the same as the bottom floor, remember if things aren’t snapping together for you, try changing the order that you are laying them out in. Now it’s time to start snapping on our roof! Now then, with the roof snapped on that concludes the basic construction of our building. Up next, cosmetic upgrades and electrical. Hopefully this will help you build the wasteland house of your dreams. Sorry it was so long... maybe I should have split it into sections... If you are having troubles getting the building to work for you, post your troubles in the comments, and I will do my best to help answer your questions. Post what you’ve created, I look forward to seeing what you can create!